It’s the end of the week and you’re overwhelmed. Between everything you’ve already done, and the uncompleted to-do list you’ve yet to finish, there is hardly any time to think, let alone breathe. It seems that everyone wants a piece of you. You can’t sit down and have a moment to yourself during the day because just when you see that light at the end of the tunnel, someone asks for something. Someone demands something of you. You’re required to get up and do even more work. You juggle so much already. Between, dropping off the kids at school. Taking care of pets. Going to work. Or maybe even doing daily household chores and errands all day. Long trips to the grocery store. Long lines at the post office. Those inevitable waits at the mechanic. Picking up the kids. Going home to prepare a meal at the end of a long day just seems grueling and demanding. It’s unfair. Why should you have this added stress? You start to wonder how you’re ever going to accomplish making a satisfying dinner for your family or friends, without losing your mind. And then suddenly it hits you! A ray of hope starts to trickle down into your mind and train of thought. You seem pleased with yourself. All of a sudden you’re smiling and giddy, and for reasons all unknown to you, you start to laugh. Why? Because you’ve just realized you sort of planned ahead. Thank goodness earlier in the week you made a Grilled Vegetable Lasagna! For when you made this lasagna, this clever blogger was thinking of you. You? Yes, you. Only you. All those you’s out there who don’t have much time during the week and are dead tired at the end of it; the last thing you want to do is slave away for hours in the kitchen. And now the question arises, how did I help you? 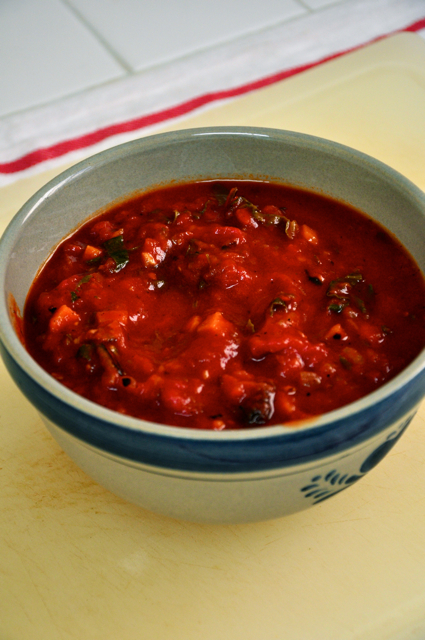 If you followed the previous blog post to the “T” you would have noticed that part of the instructions were to save the heaping amount of leftover Marinara Sauce. I advised you to store it in an airtight container and place it in the fridge for another time. I also promised there would be a follow up post to it, where I would show you what to do with your leftover sauce from the heavens. Well, I wont tell you what to do with the sauce, for if you have other ideas, please by all means use it. I’ll just inform you all on what I used my leftover sauce for. 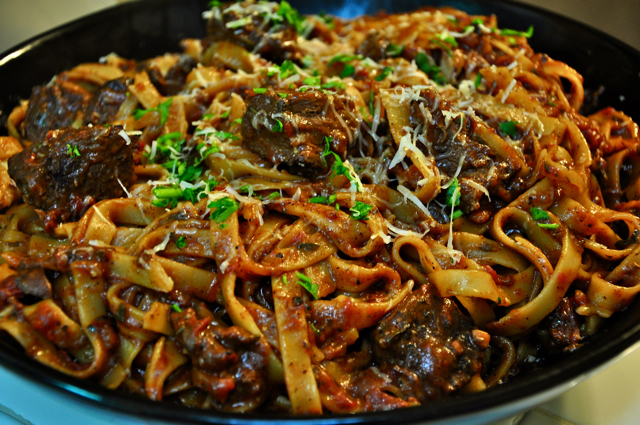 A delicious pasta dish that I and my family couldn’t get enough of. After their first serving, they came up to me and said, “Please sir, can I have some more?” Naturally my response was, “Moooooooooooooooooooooooreeeeeeeeeeeeeeeeeeeeeee?!?! ?” And then I refused to give them any and ate the rest all myself. Of course, you might be more generous than I was and share. Now, I know what you all are thinking. 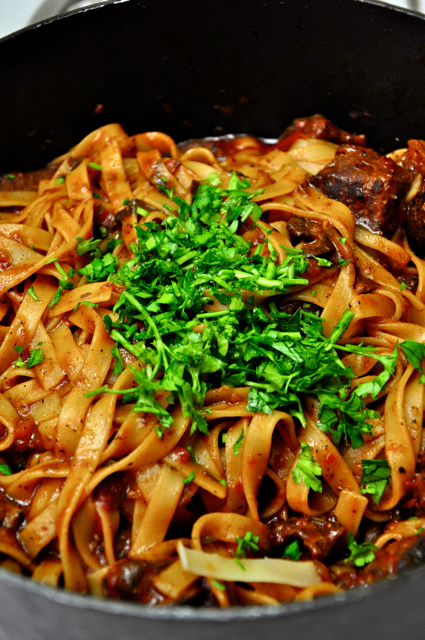 Braising takes hours, how can this be an easy, stress-free meal? Well the answer to all your problems is in this little word, braising. Yes, braising. Braising is your friend. He’s there to help you on those days when the last thing you want to do is be stuck in the kitchen. 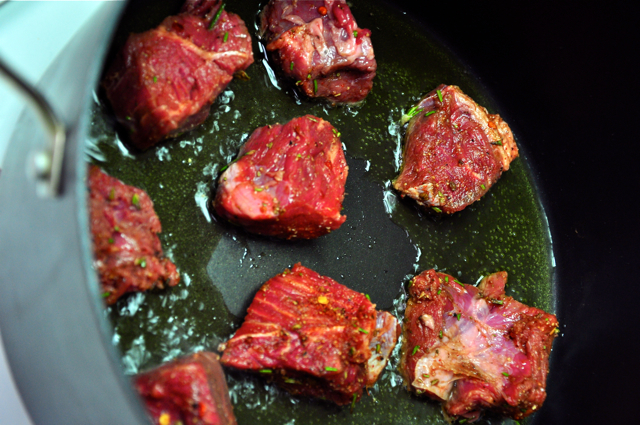 The beauty of braising is that its a cooking technique that cooks food low and slow. 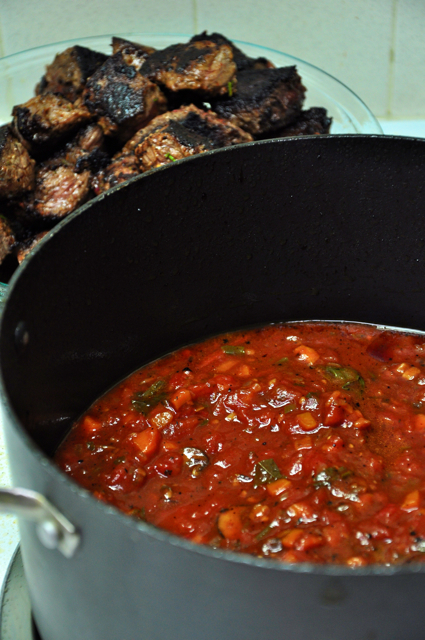 The slow cooking marinara sauce is finished, so all you have to do is sear the meat, pour the sauce in, cover the pot, reduce the heat, and forget about it for several hours. No fuss no muss. Sure you stir every once in a while, but big deal, anyone can do that. Shall we get started? What kind of beef do we need? That’s a good question, I’m glad you asked. Beef Stew Meat, of course. *gasp* I’ll wait for all the gasps, and disgruntles to finish. I know all you high-end foodies out there might be turning your noses on me for a second. Sure its a cheap cut of beef. Its tough and fatty. But that’s exactly what we need. A marbled piece of beef, perfect for braising. Our goal is to turn this rubbery tough beef into melt-in-your-mouth, tender, deliciousness. How do we do that? By braising it for several hours. Let’s start by seasoning the beef. A few dashes of hot sauce….just because. 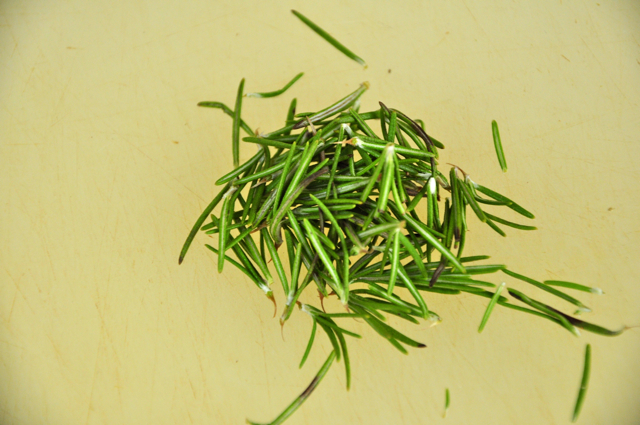 And now for some fresh rosemary. I think rosemary is perfect for this dish because A. its packed with flavor and since it’s a slow cooked dish, that flavor will intensify. And B. 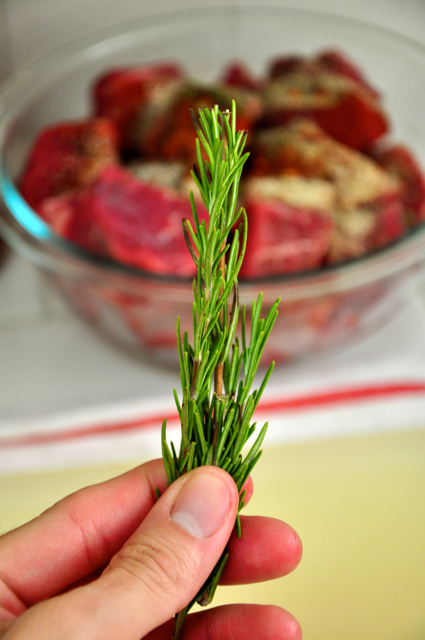 Because I happen to love rosemary with beef. Its a perfect flavor combination. Try it. 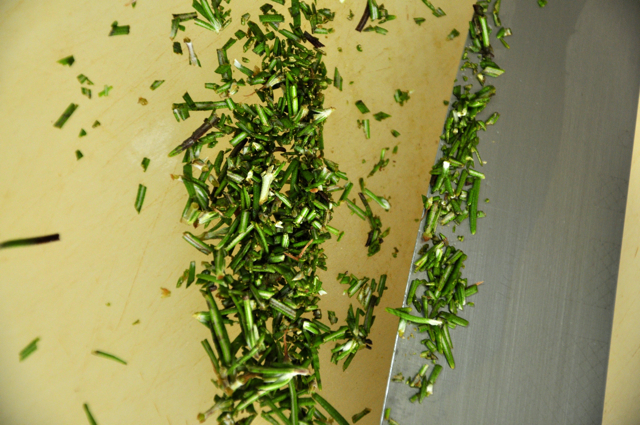 Take the rosemary off the stems. And give it a rough chop. Add it to the beef and mix everything together. Sure, use your hands. Why not? Now let it just sit for a bit. 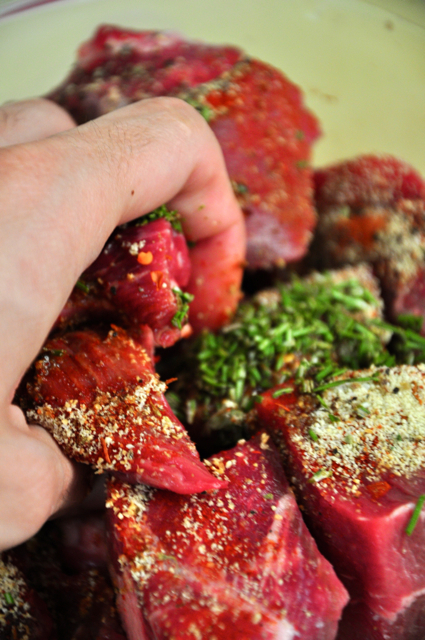 Give it a chance to mellow out so that all the spices and seasonings permeate the meat. Meanwhile, heat up a large pot. Medium-high heat. Let it get scorching hot. Throw in a couple tablespoons of olive oil. Enough to coat the bottom of the pot. We’re going to sear the beef. The trick to searing is to NOT overcrowd the pan. 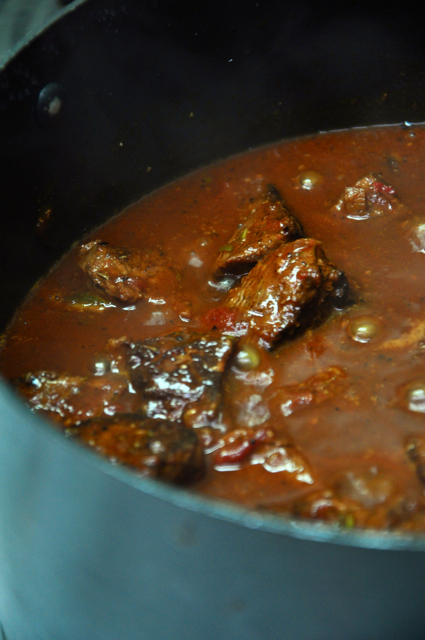 You don’t want to add too much beef at one time because then all the moisture will come out and the beef will end up simmering rather than searing. We’ve all had this happen to us. And all we get in the end is gray beef that doesn’t look too appetizing. Well I’m here to fix that. 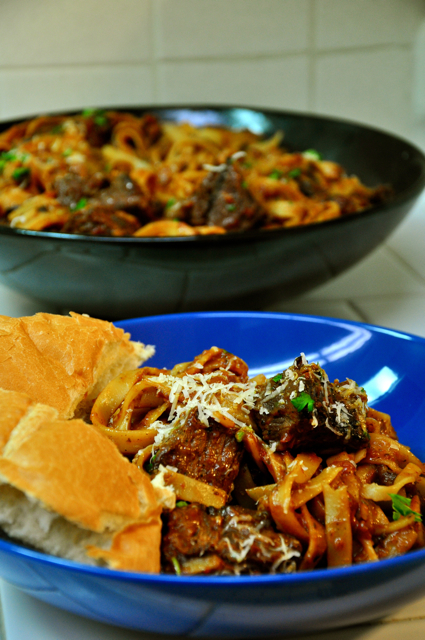 Like Julia Child said “Don’t crowd the mushrooms!” Only in this case, don’t crowd the beef! 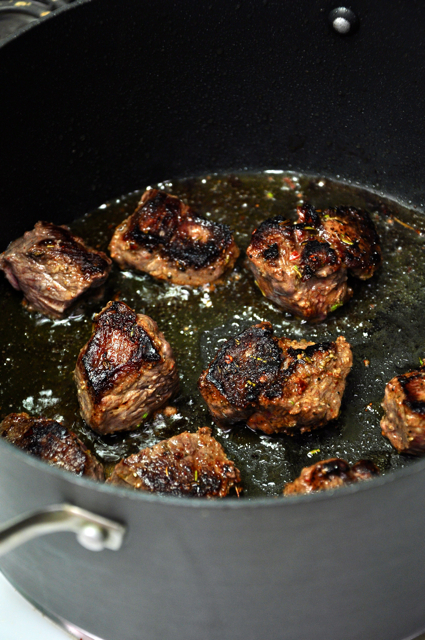 The whole point of searing is to develop flavor and caramelize the beef. It seals in the flavor and juices. 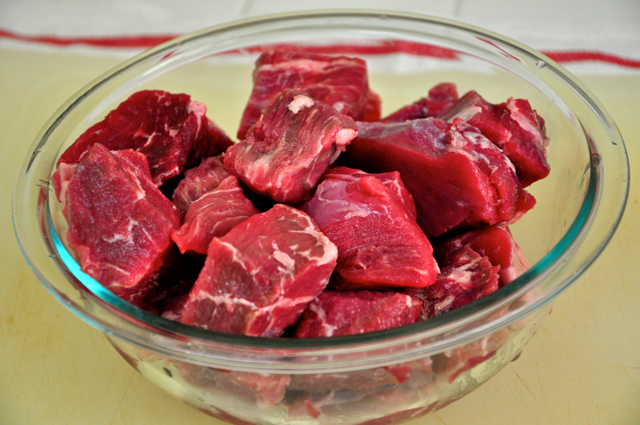 Allow the beef to cook on the first side for about 5-7 minutes or until it is brown and crispy. Now cook the second side for about 3-5 minutes. We’re not cooking the beef all the way through. 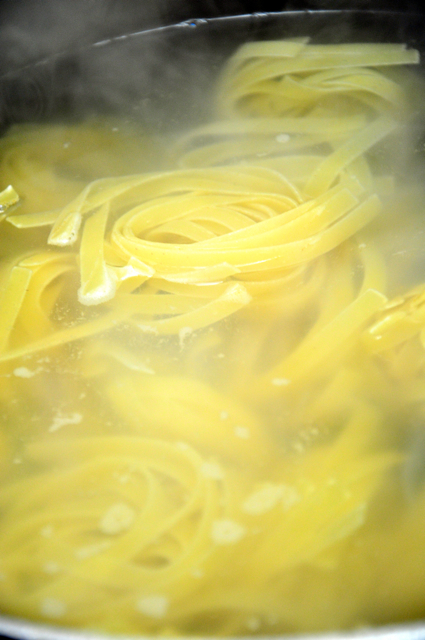 This is just a fast step to develop flavor, and then we’ll continue to cook it later. Work in batches, again not to overcrowd the pot. 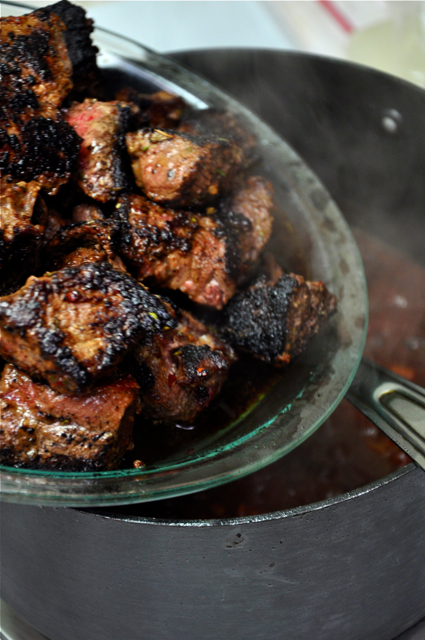 As each batch is complete, transfer the seared beef onto a plate while you cook the rest. 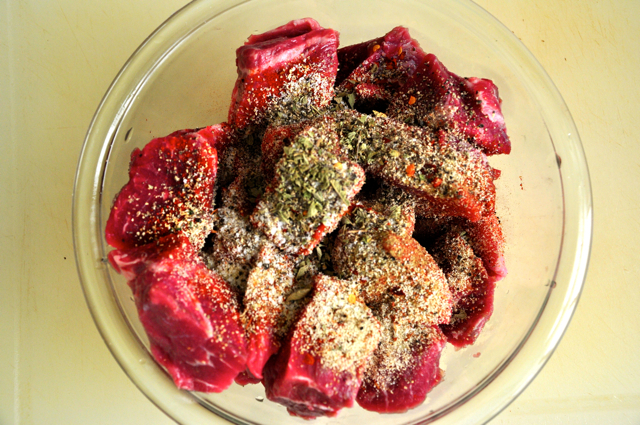 Hello little nuggets of soon-to-be tender beef. Continue to cook the remaining beef. Meanwhile take out the marinara sauce, if you had some left over from the lasagna. Ahh there it is. Our hearty marinara sauce from earlier. If you remember this has the onions, garlic, mushrooms, carrots, basil, parsley and various delicious spices. All simmered with tomatoes and white wine. Now you can definitely use store bought sauce, if you’d like. Or you can make your own recipe if you have another. Or you can find mine here, if you didn’t make the Grilled Vegetable Lasagna prior to this, just a quick batch. Once all the beef has seared. Drain out the oil and pour in the marinara sauce. Allow it to come to a simmer. Once it has, throw in the seared beef. 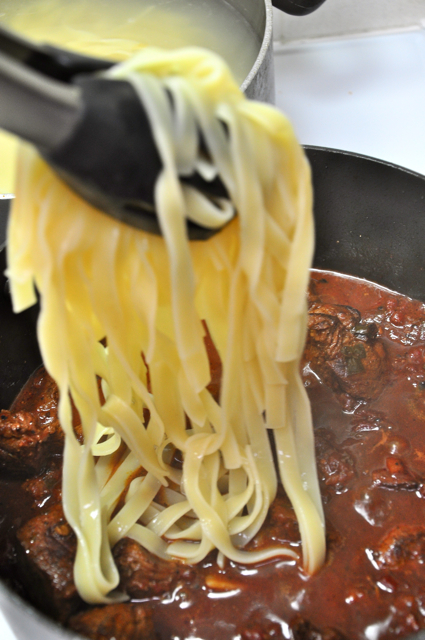 Tuck in the beef into the simmering jacuzzi of marinara sauce. Make sure it’s all in one even layer. Reduce the flame to low, as low as it will go. Cover the pot and forget about it. Let it braise for about 2 hours, on low, stirring occasionally. Or until the beef is tender and falling apart. That’s the hardest part of this whole dish. Now you can go and relax. Forget about dinner for a bit and do anything else you’d like to do while dinner cooks itself. After two hours of braising, the beef should be ready. Sneak a taste. Just one taste though! It’s ready right? That’s when we cook the pasta. Bring cold water up to a boil. Salt. And cook the pasta according to the package. I’m using a fettucini noodle. 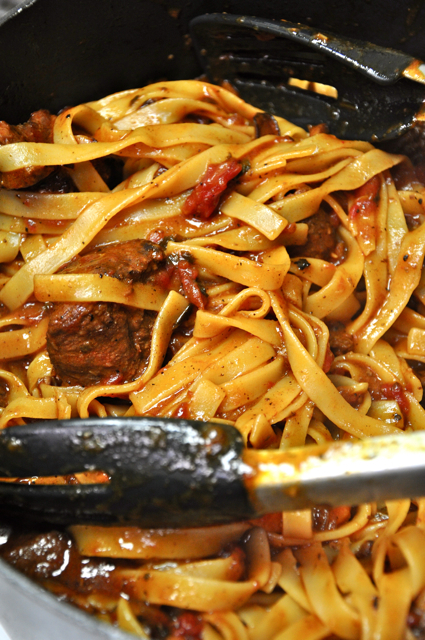 You can use pappardelle. That’s a good one for this dish as well. 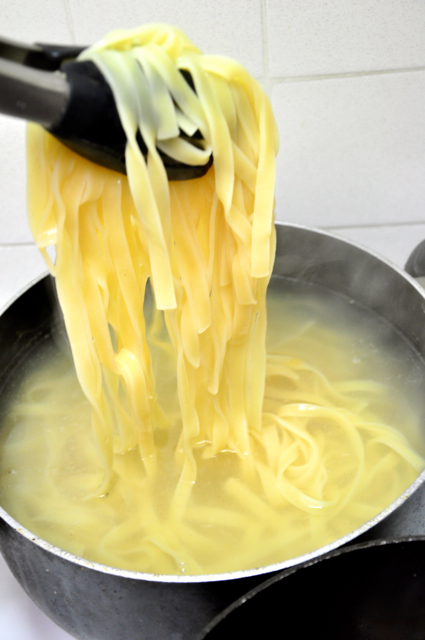 Cook the pasta until “Al Dente” which just means to not cook the pasta all the way, but just until its almost done, and still has a bite to it. 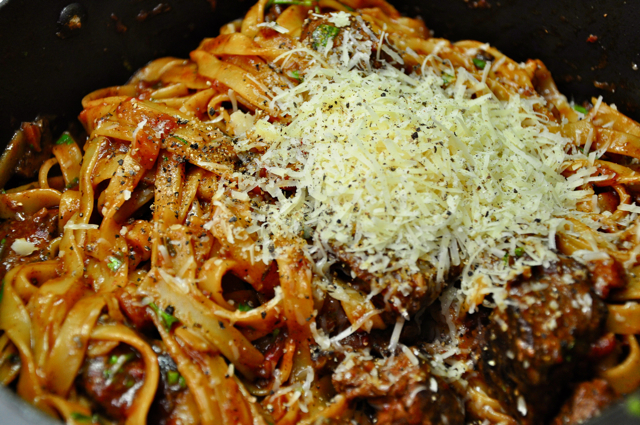 After the pasta has finished cooking its time to add it to the braised beef marinara sauce. DO NOT DRAIN THE PASTA. Again. DO NOT DRAIN THE PASTA. The best way to do this is to pick up the noodles with either tongs or a pasta spoon. Add it to the sauce. Its okay if some of the starchy pasta water gets in. We want that actually. It helps loosen and thicken the sauce a bit. It’s all about adding flavor. 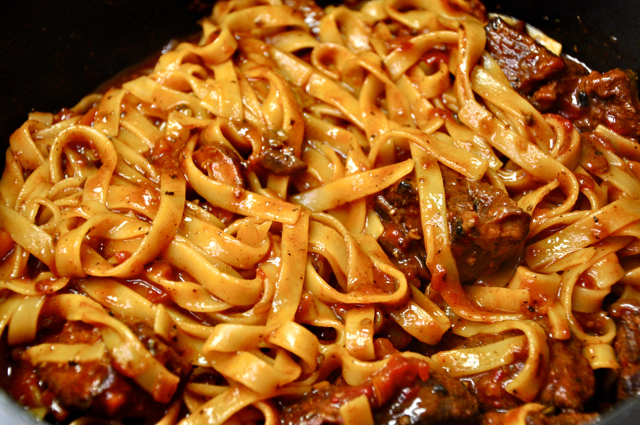 Give the pasta, beef and sauce a really good toss. Make sure to combine the sauce and pasta completely. Every noodle should be coated. Now tell me this doesn’t look good, and I’ll say you’re lying! 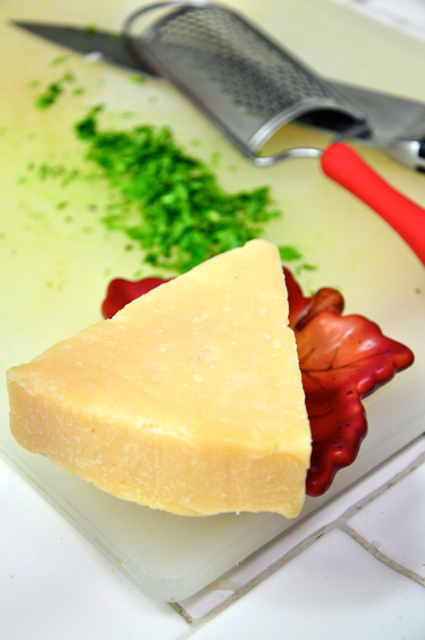 Let’s finish it off with parsley and parmesan. 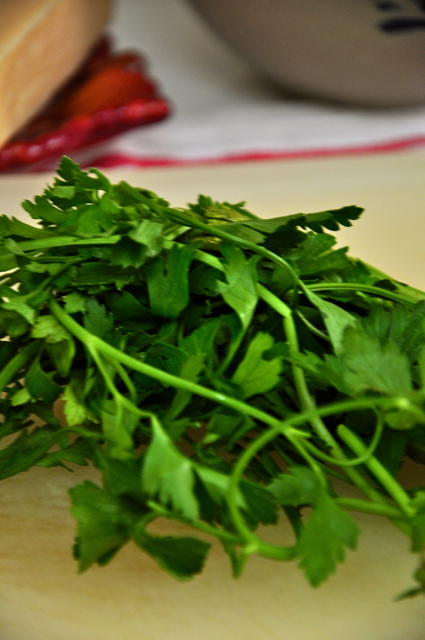 Chop the flat leaf parsley. And add it to the pasta. Throw in some fresh cracked black pepper as well. It gives it a nice finish. Give it one more toss and pour it into a serving bowl. Serve yourself up a plate. A heaping portion…go ahead. Its a good thing beach season is over. Warm yourself up with some comfort pasta. You deserve it. I like eating it with even more carbs, a couple pieces of a french baguette. If you’d like to be a little healthier, you can serve it with a salad….I guess. But please don’t tell me about it. I don’t want to hear about those healthy rendezvous. I like it better with the bread. That way I can pick up all the wonderful sauce. 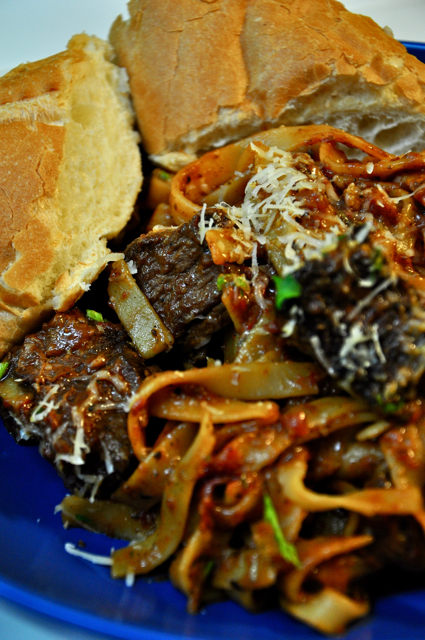 The next time you’re looking for an easy yet tasty recipe come visit me at the Candid Appetite. Print out the recipe, look at the step-by-step photographs and make it for yourself. Your family, friends, and tummy will thank you for it. Enjoy. 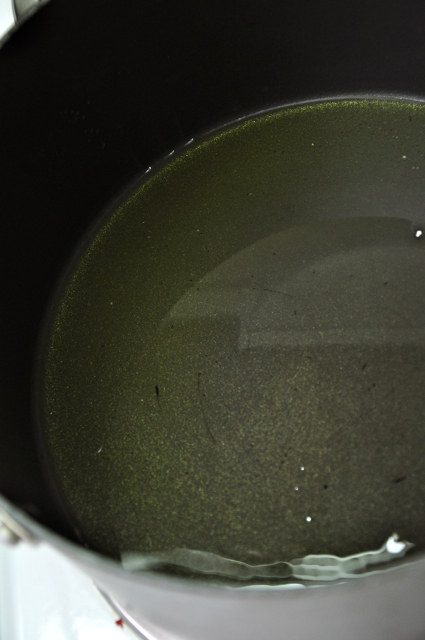 Preheat a large heavy duty pan over medium-high heat. Pour in the olive oil and allow to get hot. 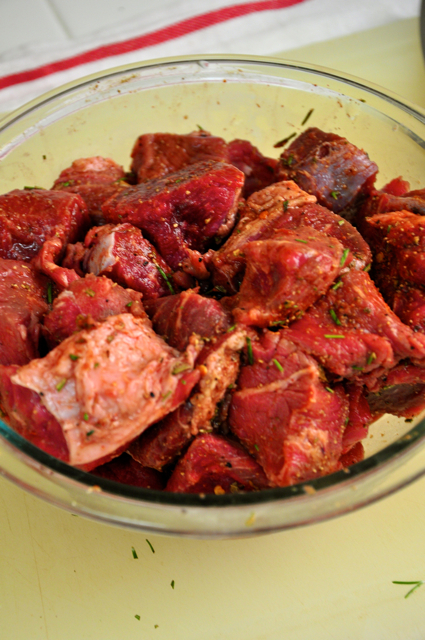 In a large mixing bowl, throw in the beef, and all of the seasonings, including the chopped rosemary. 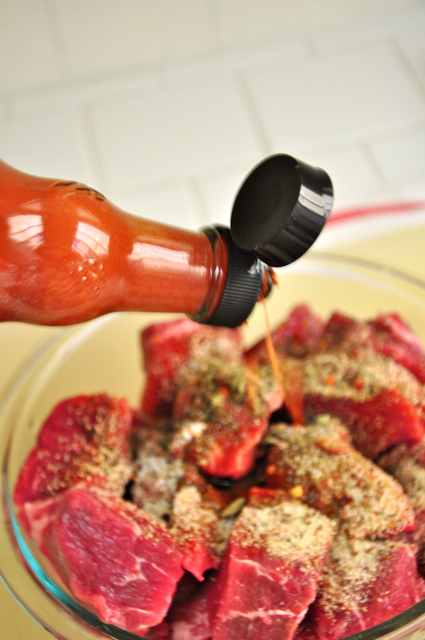 Toss the beef completely to make sure the seasonings get well incorporated. Sear the beef, in batches to prevent simmering. Allow to cook on the first side for about 5-7 minutes or until it has caramelized and browned. Flip over and continue to sear for another 3-5 minutes. When the beef has seared on both sides, transfer to a plate and allow to rest while you cook the rest. 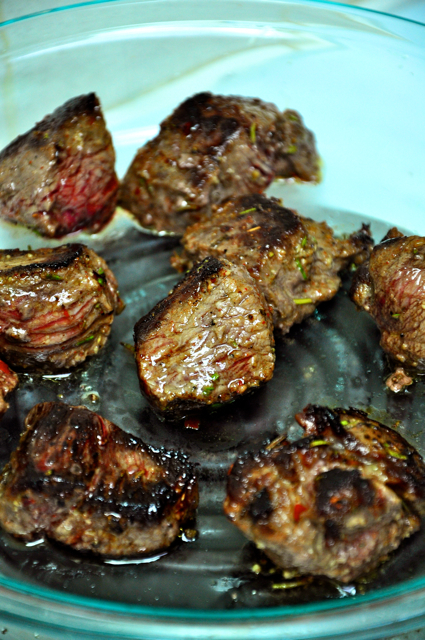 Once all the beef has been seared, drain out the excess oil. Pour in the marinara sauce and allow to come up to a simmer. 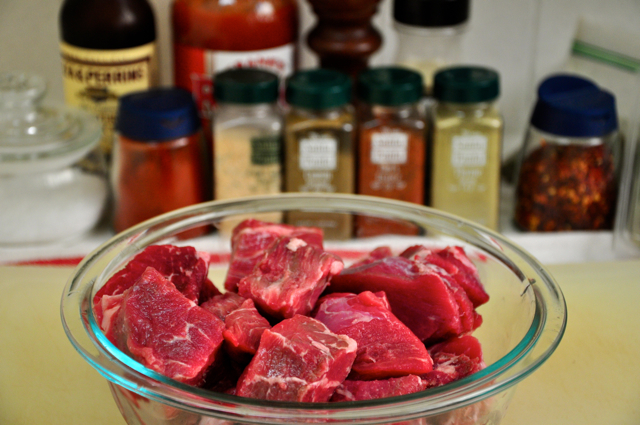 When the sauce has simmered, put the beef pack in the pot. 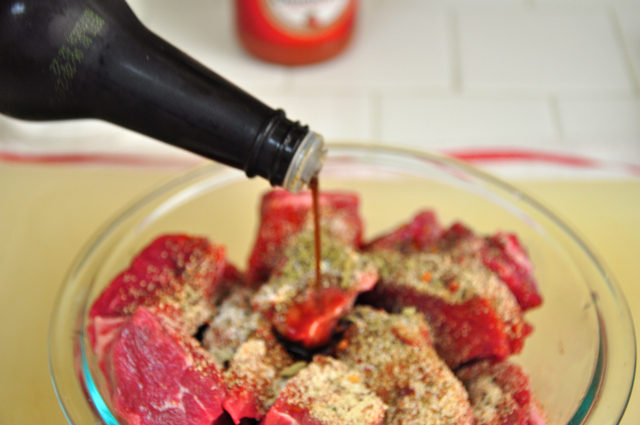 Tuck the beef into the sauce, and make sure it is in one layer. 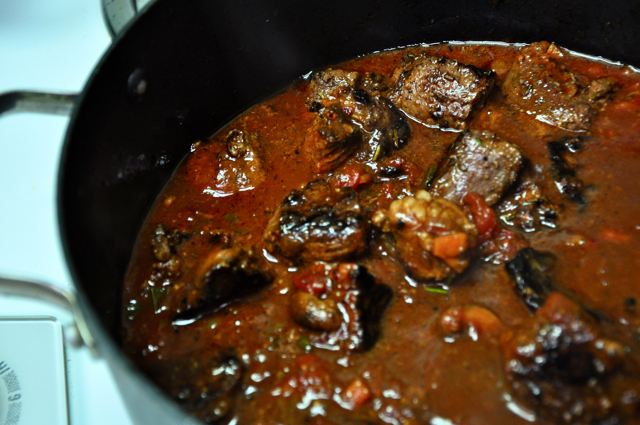 Reduce the heat to low, cover with a lid and allow to cook for 2 hours, or until the beef is tender and falling apart. Stir occasionally, replacing the lid after each stir. 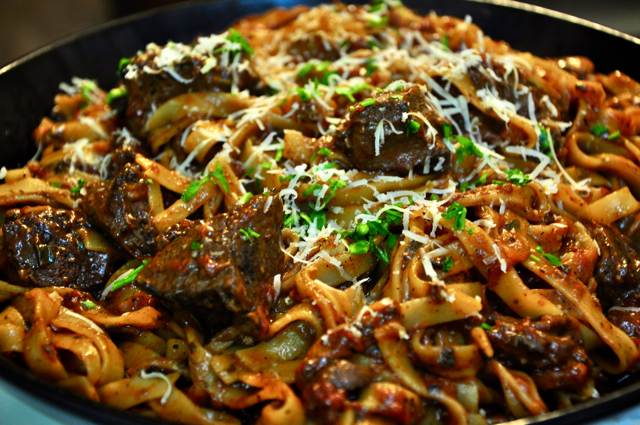 After the beef has cooked for two hours, cook the pasta according to the package directions. Bring a large pot of water to a boil. 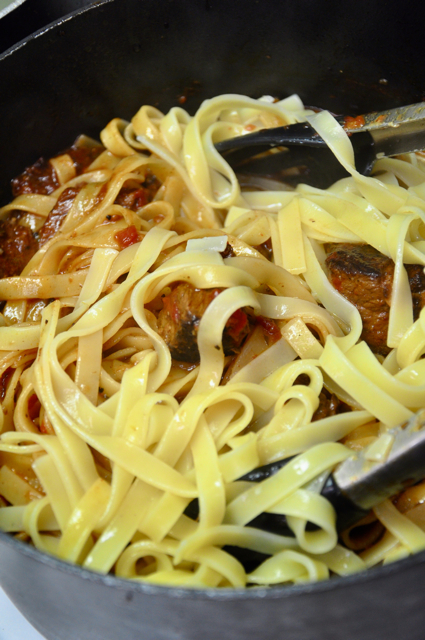 Season with salt and cook the pasta until al dente, still a little tender, not mushy. 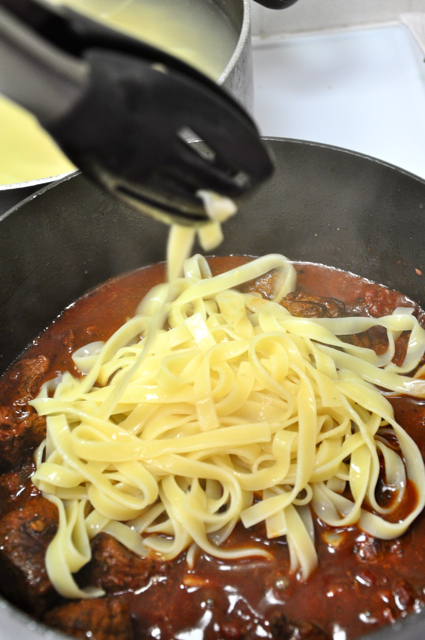 Once the pasta has cooked, transfer over to the sauce, allowing some of the pasta water to fall into the marinara sauce. Throw in the chopped flat leaf parsley and parmesan cheese. Toss completely. Serve with the sliced baguette or a mixed greed salad. Enjoy. What a wonderful post. As always. I seriously gotta attempt one of these recipes one day. I’m just gawking at this…. Gawk away! Its there for your gawking pleasure!! Thank you for sharing this – I can’t wait to try it, it looks delish! new to your site. love it! any way to print your recipes? Welcome! There is a print feature in most of the recipes at the bottom of the post. However, older recipes such as this one don’t have it because I didn’t have it available at the very beginning. All the new recipes (or the latest I should say) have the print feature! Thanks! I came across this and we are making it right now. The house smells so yummy I am ready to devour this pot of yumminess! Btw, I just had to taste the beef after it was browned because I didn’t want to waste my sauce if I didn’t like the beef. OMG the beef had such a wonderful flavor. I am going to use this to marinade ribeye steaks for grilling this summer. truth. the rub/marinade is superb although to be fair I didn’t have any cumin. Made this last night, had it for breakfast this morning, eating it again for dinner tonight. Amazing recipe! I highly recommend making this, and exactly as written. This is a keeper! !